A review of laws and regulations pertaining to the practice of surveying in West Virginia, with particular emphasis on the minimum standards. The course is designed to meet the continuing education requirement for all West Virginia licensees to obtain two PDH of minimum standards within each four year period, and has been updated to reflect the new minimum standards which went into effect May 1, 2008, and the Code changes which took effect June 10, 2010. Ethical behavior is not just required after becoming a “Professional Surveyor”. Ethics are a prerequisite before one is even qualified to seek licensure. This course looks at the Historic context of Ethical Standards, quoting and discussing the writings of distinguished authors. A look at Modern Standards for Ethical Behavior includes Voluntary Standards (specifically the Surveyor’s Creed and Canons promulgated by the National Society of Professional Surveyors); and Mandatory Standards, as found in the West Virginia Code and Title 23 of the Board of Professional Surveyors Rules. This course is designed to meet the requirement for each West Virginia survey licensee to obtain at least 2 PDH in Ethics in each four year period. Many know Mount Rushmore depicts “Three Surveyors and One other Guy”, but most know little about the surveying work of Presidents Washington, Jefferson, and Lincoln. This seminar provides an overview of that work, and also looks at the other guy, Teddy Roosevelt, with an exploration of his opinions about surveyors. No trip to Mount Rushmore would be complete without also visiting the nearby Crazy Horse monument, still being carved, so we will examine interactions between surveyors and Native Americans, and between the Rushmore presidents and natives. Moving beyond the famous people in the carvings, we will study the surveying methods which have guided the sculpture work. After looking at the techniques Gutzon Borglum used to guide his earlier work at Stone Mountain, Georgia, we will look at the work at Rushmore. The discussions wrap up with a look at how surveyors at Crazy Horse are helping provide data and control to oversee the mountain carving project. The ongoing work is being guided and analyzed today with modern technology including laser scanning, which is also being used to guide maintenance work at Mount Rushmore. Don Teter began surveying in 1974, and has been licensed since 1982. He is a past-President of the West Virginia Society of Professional Surveyors, and edited the quarterly West Virginia Surveyor for over ten years. 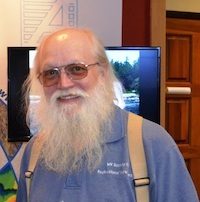 He is an active member of the Society’s Convention Committee, and has presented numerous seminars on subjects including: Minimum Standards; Boundary Research; Adjoiner Relations; Turnpikes, County Roads and Highways; Boundaries Along Roads and Streams in West Virginia; Grand Canyon Surveying; and Civil War Surveying. He also serves as a member of the Board of Professional Surveyors Complaint Review Committee and as a part-time investigator for the Board. **Members of out of state Societies can receive the WVSPS member rate if proof of membership is sent to our Admin Office at wvsps@wvsps.org.